Perfect fit! Great job, I love that pattern. He is waiting for it's time in my pattern box:) I think th material is just a bit stiff, and the front darts need to relax. But the fit is just perfect. i love them! you did a great job on them! They're very cool and the fit is great! I love these pants. Also thank you for choosing this pattern--I bought it recently, and love seeing it actually made up by a real person. Can't wait to try my own. Also can't wait to see your red "Sew for Victory" pair. Ooo I love them!! The details are so cute and the fit is great on you!! Gorgeous pattern! And such a great fit onyou! Can't believe you didn't make a muslin and they fit that well! Love the top is it RTW or hand made? 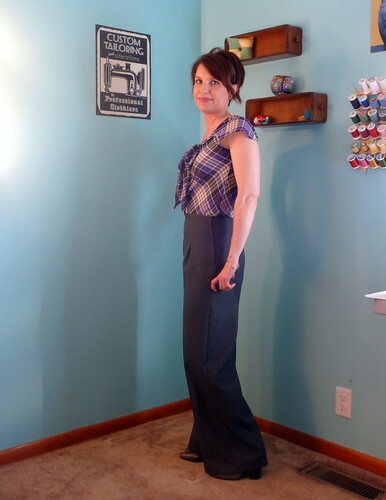 These pants look great on you and I adore the scallop detail on the front. I'm into vintage too, right now! Too cute! I need to make these! Wow, Shannon, I really like these! I think they are supposed to look that wide, that's part of the style. But, they really fit you well. I've never used my blind hem stitch. It looks so neat and perfect in your pic. Going to use it on the pants I'm working on now. IF I ever get to that stage. Thanks!! 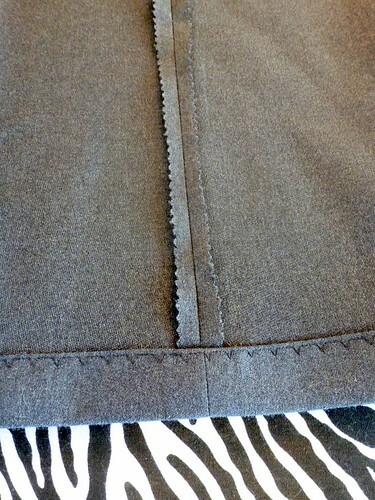 The stitch took some practice before I was comfortable with it but it makes them look more professional. Thank you! I just ordered my fabric from Mood last night. Excited!! Thanks, it's RTW, I got it from JCPenney a couple years ago. Thanks! 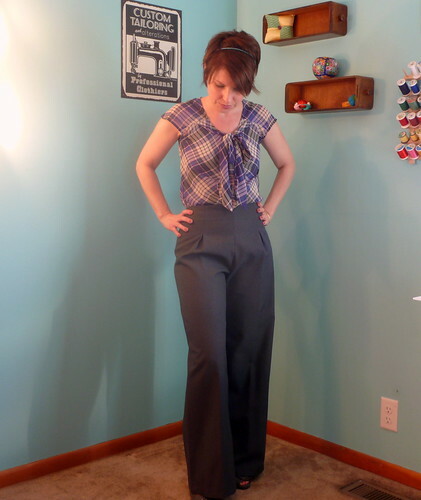 I did measure the pattern pieces and compared them to some of my RTW pants before starting. If I can avoid a muslin I will. Oh you should, it'll be fun! Thanks! This is such an easy pattern to work with. Love being able to make something in a day. 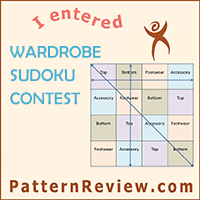 Thanks, this is a great pattern! 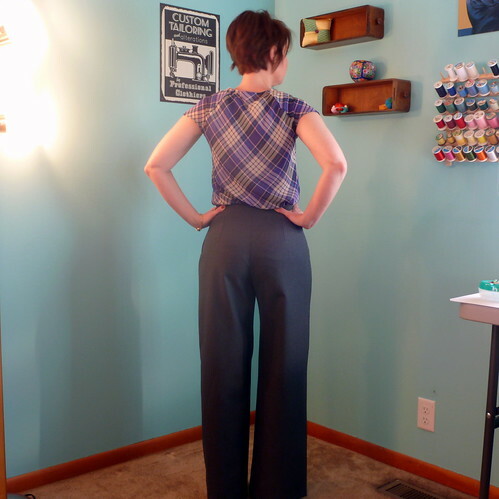 I love this pattern and have made two pairs of pants from it! Loving that gray suiting! Looks great on you! Oh I would love to see the ones you made! Wow, those fit you so perfectly!! And I'm going to use your tip on basting the sides first! 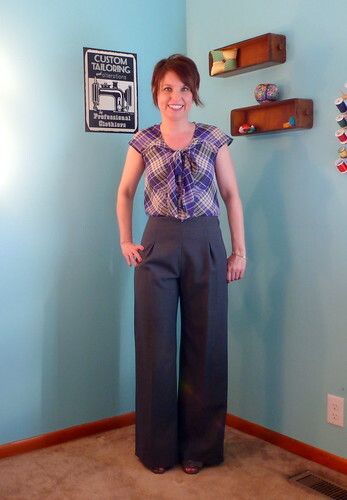 These are GREAT pants! I still haven't ventured into that realm of sewing - lol. Also, I love that TOP! Did you make it?? Why thank you, that's so great to hear!! Thanks so much!! It's taken me almost two years to get a blog design I'm happy with. I had to teach myself how to do it. Html code can be quite confusing! How cute! These look superb! What a gorgeous outfit! what fabric did you use?? 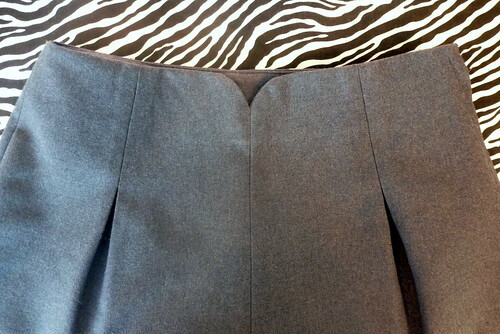 It was a suiting fabric, wool blend.